Learn Canyoneering from America's premier Canyoneering Instruction, Events & Community organization: Uber Adventures. Tuition for this comprehensive 3-day course is only $395 and includes loaner technical gear, all instruction, a 10% discount on any purchased gear from our online store, and a Certificate of Completion! 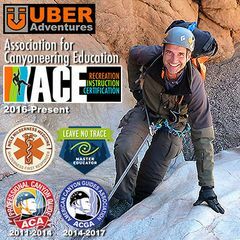 You will find a full description of this course, a full calendar of our series of courses and locations, an online store for all your canyoneering gear needs, and a list of the festivals we host, on our website: http://uberadventures.net. In addition to our official site, we also host the most active canyoneering Meetup groups, with the best-trained canyoneers in the country! http://www.meetup.com/canyoneering ...and others! Sooo ..... What is Canyoneering? Canyoneering is an emerging adventure sport which has grown significantly in popularity over the past decade. This exciting sport combines hiking, wading, swimming, jumping, sliding, boulder-hopping, scrambling, down-climbing, sometimes packrafting and always rappelling — often over waterfalls! Physically, it takes significantly less upper body strength than rock climbing, and is therefore a sport that can be enjoyed by a much larger spectrum of the population .. young or mature .. tall or short .. large or small. If you can hike, you can canyoneer! This sport has unique risks and requires a very specific set of technical skills to enjoy it safely. Rock-climbing, caving, mountaineering and swift water training teach related skills, but Canyoneering has become highly specialized. Our basic course gets you from "That looks cool!" ... to "Woohoo!" in 3 days! Check out these Vimeos and see why we are hooked on the sport! Prerequisite: None! This Technical Canyoneering Course (ACE-L1) is a beginner to intermediate course which teaches the skills necessary to safely descend canyons as part of a group (being a competent participant and the knowledge to recognize and implement safe canyon practices). This course is designed to quickly get the beginner up-to-speed on basics, to give both the rookie and intermediate canyoneer new tools for his/her toolbox, and will help intermediate canyoneers refine their current skill set! See a list of the TOPICS and SKILLS, Policies, and Testimonials on our website! Instructors: Ryan Smith & Klaus Gerhart - ACE Master Instructor/L5 Certified Guide, Certified Tactical Rappel Master, Wilderness First Responder, Advanced Swiftwater Rescue Technician, Whitewater Rescue Technician, Technical Rope Rescue Technician, Basic Mountaineering Instructor, Map & Compass Navigation Instructor and a Master Educator for Leave No Trace wilderness ethics.